Jaipur : Sawai Madhopur Railway Station of the Kota Railway Division in Rajasthan bagged the ‘Best Tourist Friendly Railway Station Award’ today. 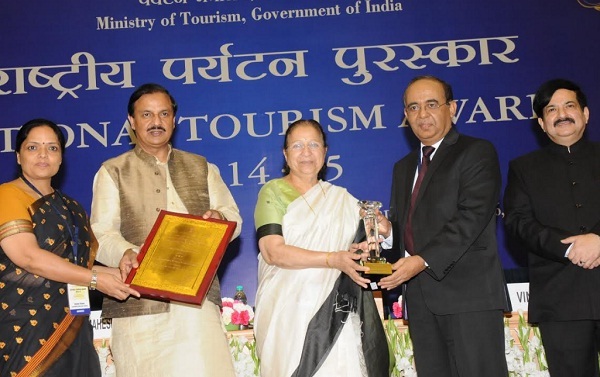 The award was given at a glittering ceremony at Vigyan Bhawan in New Delhi on the occasion of the Union Tourism Ministry’s ‘National Tourism Awards for the year 2014-2015’. The awards were given away by the Speaker of the Lok Sabha, Sumitra Mahajan and Union Minister for Tourism (Independent Charge), Mahesh Sharma. The awards were received by the General Manager of the Western Centre Railway, Ramesh Chanda and the DRM of Kota Division, Seema Kumar. It is to be noted that the Sawai Madhopur Railway Station (SMRS) is renowned in the world as the gateway to Ranthambhore Tiger Reserve. On the occasion the DRM, Kumar said that a number of initiatives have been taken to make SMRS a railway station of world class facilities. In terms of beautification too the station has been painted with wildlife and tigers. In the past few years facilities like quality drinking water, clean and passenger friendly platforms, up-gradation of the retiring rooms, bio-toilets, etc have been added at the station. Furthermore, only recently with the help of World Wildlife Fund (WWF), 7000 sq. feet area at the SMRS was painted featuring tigers and wildlife with the objective of creating awareness. These paintings have made the railway station a living art museum. Earlier, SMRS has also been awarded as the ‘First Heritage Railway Station’.